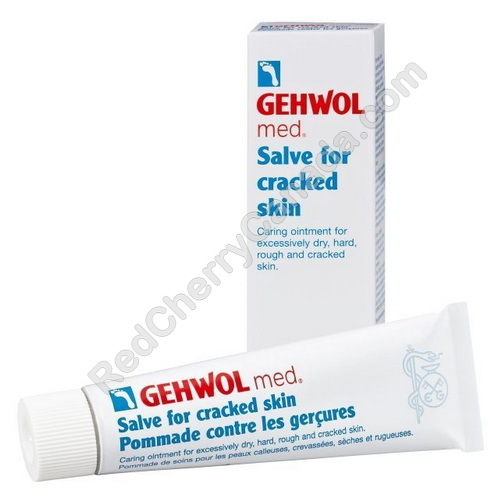 Gehwol med Salve for Cracked Skin has a base of selected oils which are kind to the skin and contain an effective combination of natural essential oils, panthenol, a skin vitamin, bisabolol, the anti-flammatory component of camomile. With regular use the skin regains its natural elasticity and resilience and is also protected. Helps to prevent cracks, skin reddening and any other unpleasant, related symptoms. Use: Massage well into the skin once or twice daily. For even quicker relief, a warm, invigorating foot bath is recommended beforehand.